Knitting is a skill that I have wanted to get to grips with for years. I learned how to cast on, knit, purl and cast off as a child, and with many a dropped stitch I could slowly produce a sort of scarf shaped thing. But I have always had tremendous admiration for those people who could turn out not just wearable but beautiful knitwear, and I am fascinated by the technology involved. It is as amazing to me that someone can take a pair of needles and a ball of wall and create a hat, as it is that you can flick a switch and get light. A few years ago my daughter gave me a lovely pattern book, and I was inspired to start knitting a simple sweater. Everything was going well, but I got to a point where I couldn’t immediately see how to make the pattern work, and so the quarter finished jumper went into a bag. I always intended to finish it, and so it came with us in the move to Clevedon. And here I found the beautiful Spinning Weal shop up on Hill Road here in Clevedon and inspiration. It’s such a great place. A warm, friendly atmosphere where they run classes and workshops in a whole range of fabric based skills, including weaving. They have a great range of yarns (and fabrics too, but it’s the knitting I am in to) and all the tools you could need. I bought a ball of an expandable tape type of yarn and knitted a simple ruffle scarf. It was easy!! Time to get the sweater out! 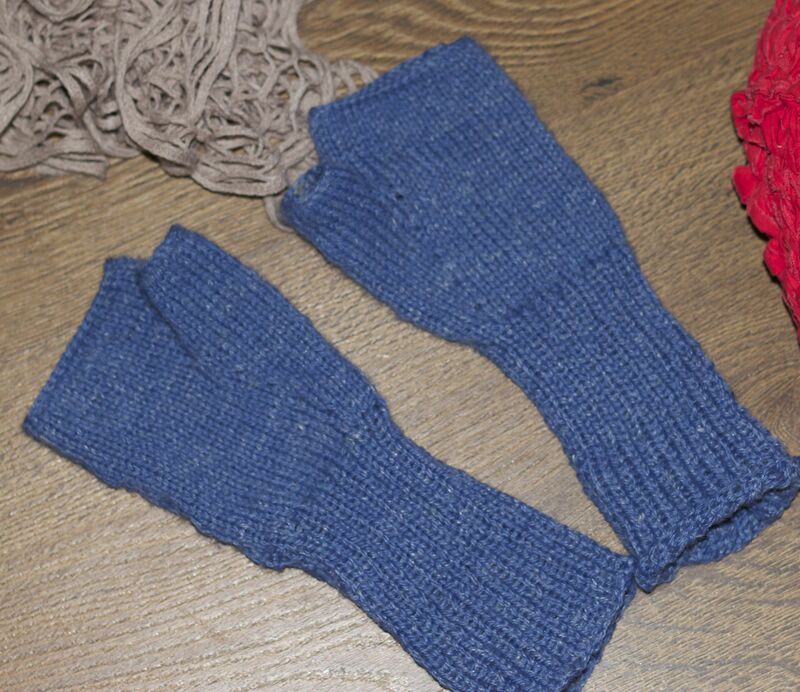 It’s a bit rustic looking – well, it was my first major piece of knitting ever, but I love it. Next I bought a book of great, simple designs by Erika Knight. Time to learn some techniques, so off I went. You Tube is there for anything you don’t quite understand from the written instructions and diagrams. A couple of scarves, two pairs of fingerless gloves, a pair of rustic socks and a rag bag have been added to my list of successes. 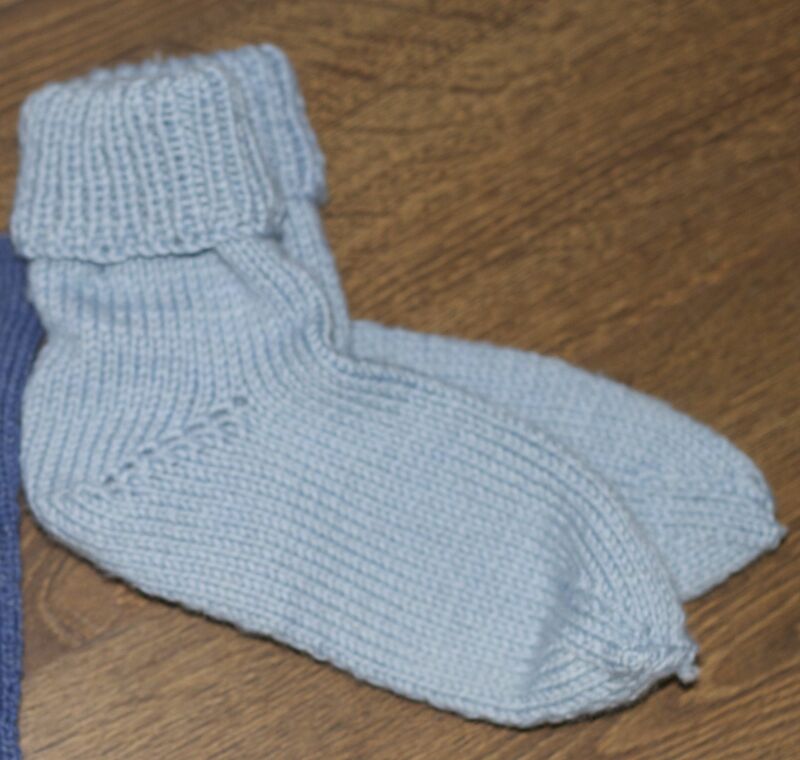 Next project: some socks knitted on four needles, and learning to do cable stitch. And then it’s crochet. Erika Knight has a great book of patterns for that too ….